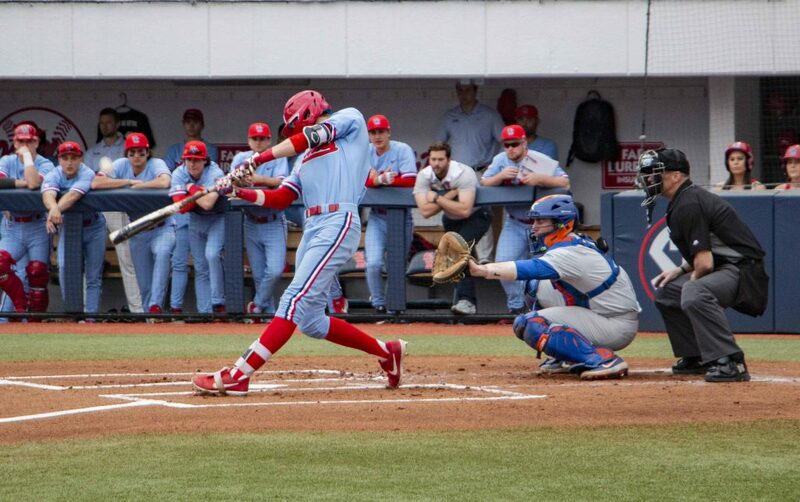 A season-long issue was too much for Ole Miss to overcome in two losses on Sunday, and the team fell 4-1 and 4- 2 to a Kentucky team struggling in the conference to end a six-game win streak in conference play. The team entered the week tied for the best conference record in the division, but they fell to 9-6 in conference play. This weekend is a missed opportunity against a struggling team from the SEC East. Kentucky is the first team in a while that had the perfect rotation to battle the Ole Miss lineup. The Rebels have done most of their damage this season against right-handers, and the first game of the series proved that. The team scored 8 runs and collected 14 hits during the win on Friday. Six of the runs and nine of the hits came against right-handed starter Jimmy Ramsey. Sunday was another story. The left-handed Mason Hazelwood and Zack Thompson both stifled the Ole Miss offense. Hazelwood pitched 5.2 innings of a shortened seven-inning game. He surrendered 5 hits but kept the Rebels from scoring. Thompson is the ace of the Kentucky staff, and he is regarded as one of the finest left-handed starters in the country. The lefty’s curveball kept Rebel hitters off balance at the plate, especially when he got ahead in the count. He received some luck from the wind as two well-hit balls to left field that usually leave the park were held up at the warning track. The likely top-15 pick faced the possibility of Ole Miss taking the lead three times. Thompson prevailed all three times. He stranded two runners in the second with a strikeout of Tim Elko. He stranded 2 runs in the fifth after surrendering 2 runs with a strikeout of Thomas Dillard. And in the sixth inning, he escaped a no-out, two-runners-on jam with two flyouts and a strikeout of Jacob Adams. These were all things expected of an elite pitcher. Coach Bianco tipped his hat to Kentucky’s ace. Gunnar Hoglund had his usual Sunday start skipped last weekend against Florida after a series of short outings. The freshman found his way back into the rotation against Kentucky, slated to go toe-to-toe with the dominant Thompson. For three innings, he bettered him. Hoglund faced the minimum nine hitters through three innings. His pitch location was good, and the curveball was a legitimate strikeout pitch. However, in the fourth inning, T.J. Collett hit a 3-run home run to break the deadlock on an 0-2 count. Hoglund was clearly upset with himself after the ball left the bat, kneeling with a disgusted look on his face. He would leave the game in the next inning after an RBI double stretched the Kentucky lead to four. There were a lot of positives for the freshman to take away from today, including 8 strikeouts, but missing over the plate became costly. His coach approved of the outing, all things considered. Houston Roth pitches the ball at the game last Saturday against Florida. The Rebels will play at home this weekend in a series against Kentucky. Photo by Katherine Butler. Doug Nikhazy had one of his worst outings as a weekend starter, leaving the game after 3.2 innings. The Wildcat hitters barreled the ball well against the left-hander, collecting 6 hits and 4 runs. Four of the hits against him were extra-base hits, two doubles and two home runs. 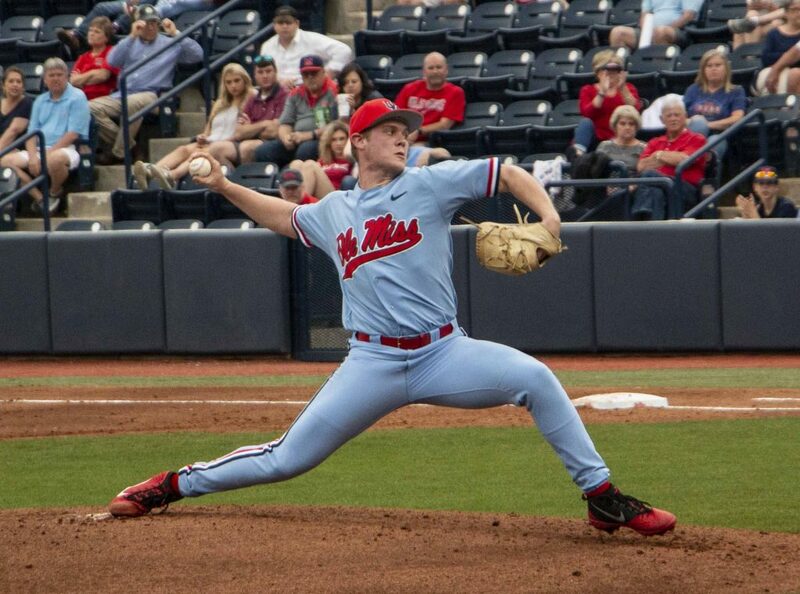 Nikhazy’s emergence as the second starter behind Will Ethridge has, in a sense, saved the season for the Ole Miss baseball team. After him, it has been a revolving door of bodies that cannot lock down spots as starters. In a weekend where he looked vulnerable, Ole Miss lost a series. The offense did not produce many bright spots on a cloudy Sunday. However, Grae Kessinger’s bat is becoming just as valuable, if not more valuable, than his glove. The junior leaves the weekend with a 25-game on-base streak. He went 7-10 at the plate over the weekend while walking once and getting hit by a pitch. His solo home run on Friday was one of his 4 RBIs for the series. His batting average has risen to .342, closing the gap on Thomas Dillard for second-best average.